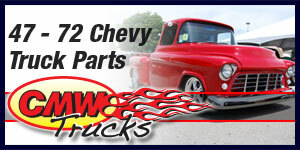 ZZ572/620 Deluxe - Big-block performance with torque to spare. When you’re ready to really step it up, it’s time for the GM Performance Parts ZZ572 and it’s massive 620 horsepower and 650 lb.-ft. of torque! This is flat-out, the baddest street Rat available that still happily runs on pump gas. The ZZ572/620 features 572 cubic inches of pure big-block and ships to your door in the coolest collection of orange, chrome, and aluminum you’ve ever seen. There are several custom-designed components that make the ZZ572/620 the king of the street. It has a strong, 4-bolt block that was created with a 4.560" bore just for the 572" displacement. The 572 block is fortified with a forged crank, forged rods, forged pistons—everything was designed to offer you the ultimate big-block experience. To feed all of those hungry cubes, we topped it off with a single-plane intake manifold that has been port-matched to the ectangular-port aluminum heads. A custom, hydraulic roller camshaft uses .632" lift perimeters to lead the charge. We make no apologies if the loping, aggressive idle of this camshaft attracts attention. 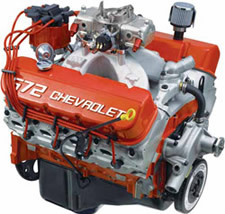 The Deluxe ZZ572/620 comes complete from oil pan (with windage tray) to carburetor, including an 850-cfm Demon four-barrel, HEI distributor, red spark plug wires, aluminum short-style water pump, and automatic transmission flexplate. It’s the ideal combination of big-block parts—designed, validated to GMPP standards, and tested in real world applications. Comes with a 14" automatic transmission flexplate. Requires internally balanced flywheel for manual transmission applications. You do have a strong transmission and rear axle, don’t you?